Autodesk released AutoCAD update last week. You should see the update in Autodesk Desktop App and be able to install it from that app. 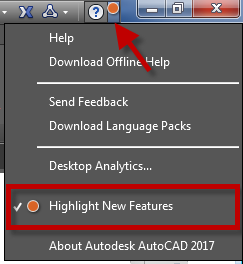 After you install this update, your AutoCAD version will be AutoCAD 2017.1. You can’t manually download and install it from AutoCAD download page like other regular updates. It’s a good thing that now Autodesk improve the functionality before the annual release. What are the new features? After you installed the update, you can see the new tools are highlighted on the ribbon. There are orange circles at the new tools icon. It’s a good way for us to find what are new quickly. We often miss the new features in new releases. This highlight probably can help us to explore new features quickly. These highlights will not be turned off after you use the tools. I don’t know if they will be gone after a while, but if you don’t want to see the highlights, you can turn it off by clicking the down arrow near the help icon. Click Highlight New Features option. You can control this option using HIGHLIGHTNEW system variable. AutoCAD has a problem when working with the high-resolution display (larger than 4K resolution). The texts on the palettes are truncated, or the texts are too small. This has been a problem for years, and we need to use this workaround to use it comfortably. In the new update, this issue has been resolved. You can maximize your screen resolution now! Probably not all AutoCAD users realize this. After you select objects then you pan the screen to select objects off the screen, the previous selection will be removed. You can only select objects that are shown on your screen. This issue finally resolved in this update. It does take a long time, but I’m glad that this is finally supported. AutoCAD 2017 finally supports PDF import. You can directly import a PDF file to a native AutoCAD format. However, SHX font will be imported as geometry, not texts. It will make text editing difficult. This update includes a tool to recognize SHX fonts. 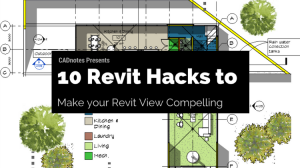 The text will still be imported as geometry, but you can convert them to text in AutoCAD later. TXT2MTXT is not a new feature for AutoCAD users. It’s been included in Express Tools for years. But now this tool is graduated from Express Tools and become AutoCAD core. It’s probably means nothing for AutoCAD users, but for AutoCAD LT users, it means they can use this functionality now. AutoCAD 3D navigation now becomes faster and smoother. I tried it and can feel the significant difference when working with a large model. But, there are some conditions to met before you can feel the performance. If the performance boost doesn’t work, you will see this notification bubble. Read about Enhance 3D Display Performance here. If you want to read more about this update, you can read about AutoCAD 2017 fall update on AutoCAD blog here. There is a video that shows the new features at the bottom of the article. my Desktop App show me ( Your Available updates are installed ). I don’t know what happened to my AutoCAD 2017.1. . since AutoCAD SP1 is installed. any idea…? If you open About dialog in AutoCAD, what version does it show? If it says 2017.1. then it’s already installed.